If parents are sending their children out alone on Halloween to knock on strangers' doors they may need to think again! 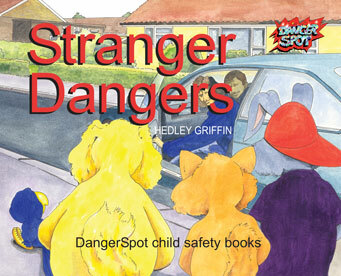 See our range of child accident prevention books. Halloween is celebrated on the eve of Samhein, November 1st, the Celtic pagan festival. It was in 835 AD that the Roman Catholic Church changed the day of Samhein into a Christian festival day. It was to be known as the Feast of All Saints, All Saint's Day. The old word meaning saint or holy person was "Hallow", used in "Hallowed be thy name" from the lord's prayer. Because of ancient Celt rituals that celebrated November the first as the New Year, New Years Eve was celebrated on October 31st. The modern associateion of witches and evil spirits comes from the time when evil spirits were thought to roam the night. The celebrations were held to frighten away these evil spirits and cleanse the community for the coming New Year. Christianity adopted the festival and made it into Halloween. Unfortunately, for some, it is also a festival celebrating witchcraft and the black arts. they insist on sending them out at night on Halloween. Never allow a child out on Halloween without a responsible adult. Children should always tell their parents where they are going. Wear bright, reflective clothing or have reflective patches somewhere on the costume. Carry a bright torch to illuminate pavements and paths. Make sure they have a mobile with them or some form of alarm. Advise your children never to enter other peoples' homes, for whatever reason.